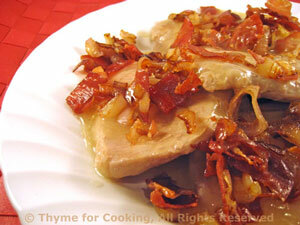 Veal Cutlets with Crisp Shallots and Prosciutto, from Thyme for Cooking. The tender veal scallops cook quickly and are finished with a light white wine sauce and topped with crisp shallots and Prosciutto. Turkey scallops can be substituted for the veal. Peel and thinly slice shallots. Heat oil in skillet, add shallots, and sauté until tender and translucent, about 5 minutes. Add Prosciutto strips and sauté until shallots and Prosciutto are brown and crisp, about 10 minutes longer. Add veal and quickly brown on both sides, about 1 1/2 minutes each. Add white wine, chicken stock, reduce heat and simmer 10 minutes. Remove veal to a small platter. Add cornstarch to skillet and stir until thickened. Spoon sauce over veal, top with shallots and Prosciutto and serve.